With the ongoing momentum of cryptocurrency trading, a unique token has developed that has seen impressive diversification and expansion as of late. This token family is known as a ‘Stablecoin’ and refers to its fiat backed nature. In essence, many institutions realized that heavy traders and hedge fund managed portfolios required an option to form liquidity into less volatile options during trading decisions. The ability to buy low and sell high is further facilitated by allowing stablecoin holding of little to no change, then easily exchanged into more volatile token offerings when a revenue option presents itself. Below we’ll take a look at each group individually and then see how they work together as a unit. It is important to understand these key factors as the economics behind fiat currency directly influence the tokenomics of the stablecoins being released today. As with any commodity, supply and demand directly impact the overall worth of a currency. In the case of the US dollar, when the USA exports goods, it creates a demand for the US dollar associated with those goods. In similar fashion, the issuance of bonds by US corporations to raise capital requires foreign investors to make payments in US dollars to purchase stock. This further drives the demand for the dollar. Different than cryptocurrencies, however, fiat currencies are able to be produced by governments which creates a supply that is not set and brings inflationary factors and concerns. As we know far too well with crypto markets and exchanges, overall sentiment and market psychology play a dominant role within the value of a currency as well. Specifically, in the US, a weakened economy or unemployment rate can lessen the value of the dollar based on usage and demand. We see this globally due to internal strife or outside country pressure. For instance, the Turkish Lira has dropped due to tariff’s from the US in the past. Similar events due to public and social statements have plunged governmental currencies to lows based on the psychology behind the longterm factors they inevitably bring. Several technical factors associated with the above categories can affect fiat currencies as well. Should a government choose to issue more currency and depreciate the dollar value, this can continue to have ripple effects. Many large institutional banking corporations can also turn suit, further heightening, or likewise stalling, some of these market movements and changes. Government statistics, reports, and data can further tie into these decisions and are essentially the mitigating factors that drive the success and decline of worldwide markets. Now that we have a grasp of fiat currencies, how does this relate to Stablecoins? Simply put, “Stable” coins are those tokens that have direct fiat backing with the corporations that are issuing the cryptocurrency. Take for instance Tether, or USDt, that we will go into more detail later. As the most widely used stablecoin in the market today, traders place trust that US dollar backing is stabilizing the token’s value. As we’ve seen with fiat value factors, supply & demand, psychology, and technical factors also affect the trust in the token and the pricing associated with it. In a perfect world, 1 fiat backed crypto token should always equal a set value in it’s given ‘stablecoin’ pair. If USDt is paired to Bitcoin for instance, while Bitcoin may rise and fall in volatility, the most current value of Bitcoin should always be able to transfer to USDt for a stable US dollar value. 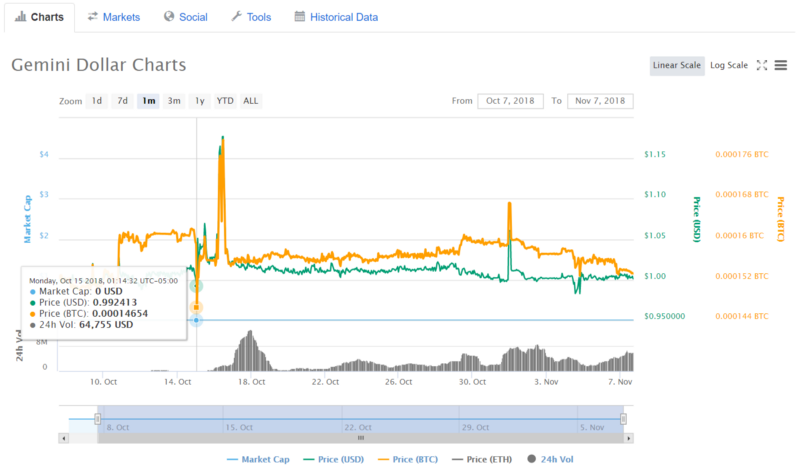 What we’ve seen recently, however, is an increased volatility within the stablecoin market that has brought on more traditional fluctuations in value and token sentiment. Understanding the traditional factors that affect fiat help us better grasp why these changes can, are, and will continue to occur. Tether is a token backed by actual fiat currency assets, including USD, Euros and, soon, Japanese Yen. One Tether equals one underlying unit of the currency backing it, e.g., the U.S. Dollar, and is backed 100% by actual assets in the Tether platform’s reserve account. Being anchored or “tethered” to real world currency, Tether provides protection from the volatility of cryptocurrencies. Tether enables businesses — including exchanges, wallets, payment processors, financial services and ATMs — to easily use fiat-backed tokens on blockchains. By leveraging Blockchain technology, Tether allows you to store, send and receive digital tokens person-to-person, globally, instantly, and securely for a fraction of the cost of alternatives. Tether’s platform is built to be fully transparent at all times. 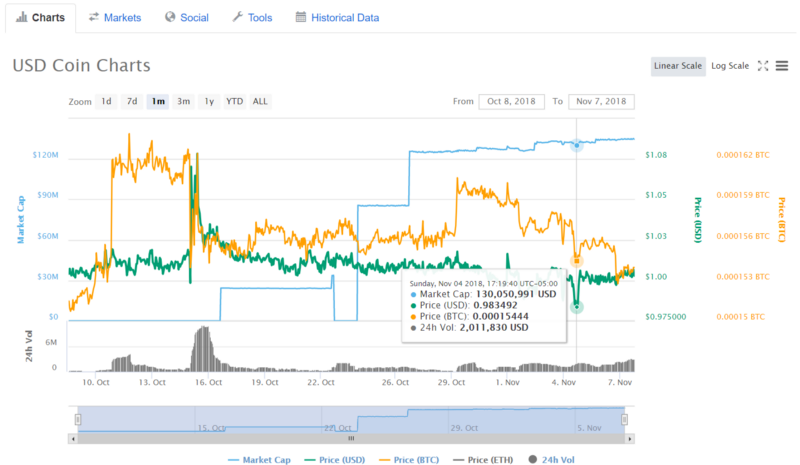 For a significant time, Tether’s value stayed stable with little to no fluctuation. A quick perusal of charting, however, shows that ongoing questions to transparency and market psychology and sentiment have had drastic effects to its stability. In crypto markets, the change of a few cents may be seen as minor at best, but in a token that is foundationally created for stability, it can have a widespread and longterm effects on those that choose to utilize it. 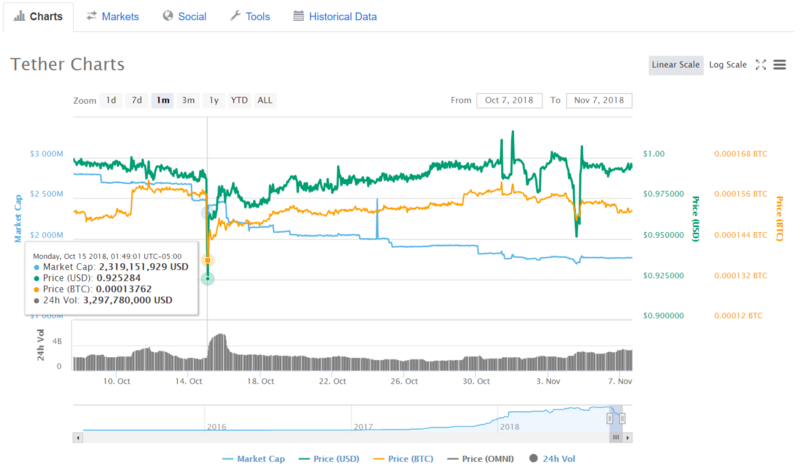 As seen above, we’ve seen tether rise in price to as high as $1.02 USD, to as low as $.925 USD. While minor in dollar value, it remains significant to large institutional funds that choose to hedge their investment value in USD backed stability. With that said, Tether remains as the stablecoin with the most institutional and exchange partners, which continues to drive its recovery. This is not to say that market sentiment and corporate policy couldn’t affect it further in the future, however. In fact, due in part to the ongoing market question, Tether has issued transparency payments to further refine its process of proving its fiat backing. Gemini, the exchange founded by the famed Winklevoss twins has identified the need for ongoing transparency and accountability within the stablecoin market and has issued their own token recently. As noted from their website, several different factors are driving their reputation and notoriety within the token value as outlined below. U.S. dollars that correspond to the Gemini dollars issued and in circulation are held at State Street Bank and Trust Company. The U.S. dollar deposit balance is examined monthly by BPM, LLP, a registered public accounting firm, in order to verify the 1:1 peg. All Independent Accountants’ Reports are published and available, you can look for them here. The Gemini dollar is a cryptographic token built on the Ethereum Network according to the ERC20 standard for tokens. The code of the Gemini dollar smart contracts has been audited by Trail of Bits, Inc., an information security research & development firm, whose report is publicly available here. Taking a look at charting we see that the Gemini Dollar or GUSD has seen much less volatility concern than some other tokens in its category. With that said, it is still a relatively newly issued token with far less volume, which is some of the mitigating factors surrounding that price history. Given more time we will be able to see whether Gemini’s increased auditing and transparency stance will continue to drive itself as a dominant stablecoin option for investors. Circle is a regulated Money Transmitter, so we’re an open financial book. Before USDC can be used, the associated USD is deposited with one of our accredited bank partners — and we publish those holdings regularly to verify the 1:1 ratio. Poloniex, and by virtue of purchase, Circle, are longstanding participants within the crypto market industry. With the introduction of USDC, Circle aims to provide a transparent and open option for market participants that wish to hedge their portfolio values within a chosen stablecoin. Looking through the charting we see limited volatility, however keeping in mind it remains a relatively newly issued crypto token option. Millions of transactions across the globe are exchanged within stablecoins given their quick liquidity option and volatility management. As is the case with any industry, the emerging growth of numerous options and competition further drives innovation and development to help shape the trading features and options we have available within our arsenal of trading tools. Personally, I look forward to seeing the stablecoin market grow and witnessing the expansion of regulated and audited token value storing options. Do yourself a favor and check out Blox today, you will be glad you did! Disclaimer: I am not a financial adviser, this is not financial advice. Investment involves risk. Do not invest what you cannot afford to lose.